Scholars at Risk invites academics, researchers and research centres interested in participating in the monitoring project, either in collection and verification of monitoring data or in post-monitoring advocacy to contact us at sarmonitoring@nyu.edu. SAR especially invites interest in research partnerships between researchers and centres in the global north with counterparts in the global south. 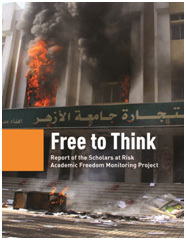 Scholars at Risk recently released Free to Think, a report of the Academic Freedom Monitoring Project. The culmination of four years of monitoring and analysis by SAR staff and researchers around the world, the report analyzes 333 attacks on higher education communities in 65 countries from January 2011 to May 2015, demonstrating the pressing need to raise awareness and document attacks on higher education. The report calls for concrete actions to increase protection for higher education communities, including documenting and investigating attacks, and holding perpetrators accountable. SAR invites you to download and share the report with your networks over social media. Use the hashtag #Free2Think and join the conversation!